A man is sentenced to death for the murder of a policeman, but his barrister's wife is determined to prove he is innocent. Courtroom drama, starring Anne Baxter and Adam Faith. 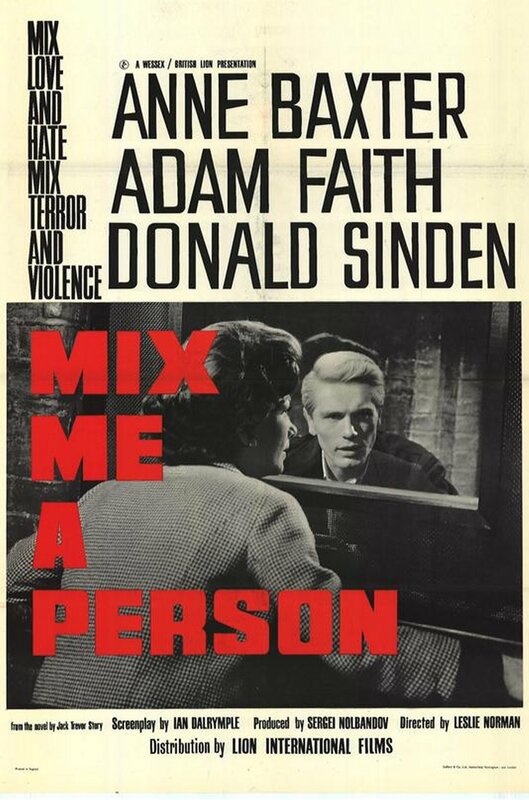 Adam Faith shows Anne Baxter and Donald Sinden a thing or two about natural acting. While they play to the gallery, the 50s/60s pop idol nicely underplays his part as a young lad charged with murder. The scriptwriter/production designer/director has a ludicrous, but typical idea of what 'upper-class' Sinden calls a teddy-boy (already a dated idea in 1962.) Faith and his mates are a neatly attired, clean-cut crowd, hanging out in an espresso bar, decked with pictures of Ella Fitzgerald and Chris Barber. The film is fairly well directed. The script is a little jaded and unreal. 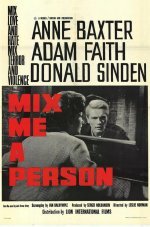 Otherwise Mix Me a Person is well above average for a British B movie; and is much, much better than the cops and robbers tripe that was typical of the period.